It was Friday again. Happens every week, I suppose. And it’s my only full day off work. It’s also that special day I get to spend with Cameron. I’m soooo glad we pulled her out of public school. She’s 15 and time is racing by. She’s happy. She’s learning. and she’s a part of a great group of kids. and most importantly, her relationship with Christ is growing and thriving. Enough of that. Here’s another glimpse into the mundane, with a splash of … well… ordinary. First a trip to the gym with Cameron and Abbs. We are doing a program we found on Pinterest called “Lose a Size in 2 weeks”. Riiiiight. Really, I just wanted a change in my exercise routine. And I’m not gonna lie, the thought of losing that last 5 lbs was creeping at the edges of my brain. I’ll let you know next week if it worked—although it’s probably for people who have more to lose than we do. If nothing else, we are learning some great core and strength moves to add to our repertoire. 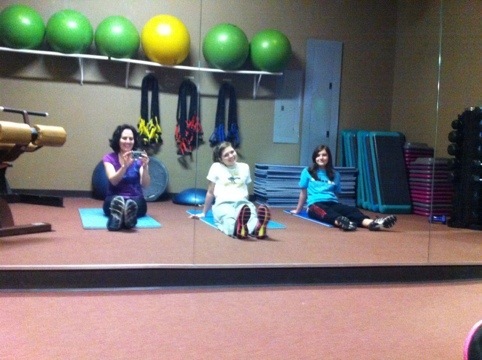 Here we are getting ready to do the “strength training A” exercises (cardio already finished up!). Cameron and I went back to the zoo to take a few more pictures. She’s looking for a picture to blow up and hang in her room. 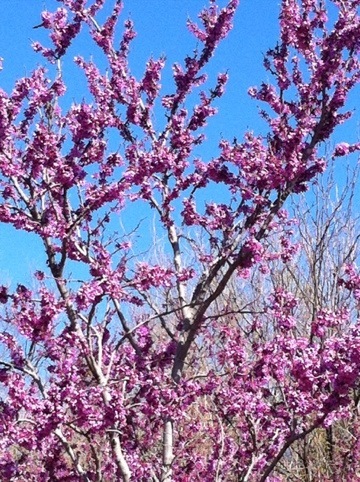 Here’s one I took of the Redbud’s blooming. It was a gorgeous day and there was hardly anyone at the zoo. 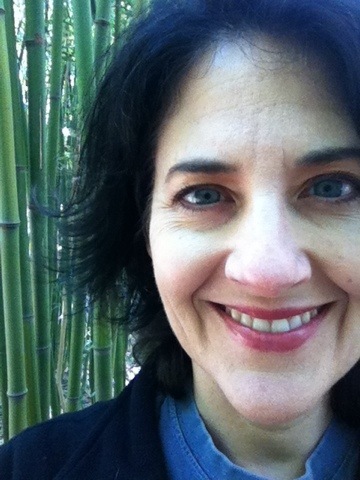 I took a picture of myself again (right before my haircut, of course). A quick trip out to Pop’s for a bottle of Pepsi–original glass bottle for Cory’s birthday. If you’ve never been to Pop’s it’s worth a stop next time you’re in the area. 100’s of different kinds of bottled soda and the best onion rings in the state! 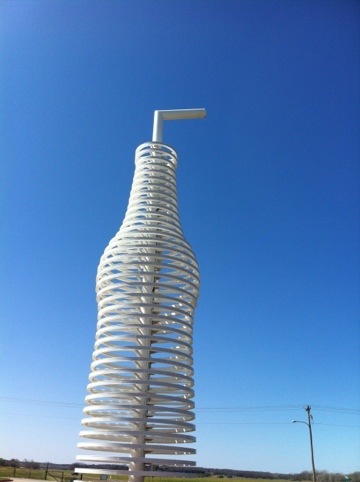 and this really cool landmark–a giant soda bottle–that lights up at night!! It’s a little ways out of town up route 66, but I like the drive. 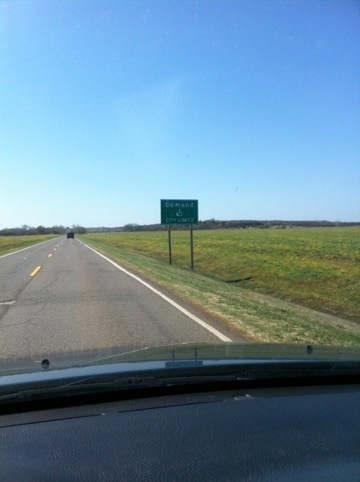 I actually left Edmond twice today and I didn’t get lost once–well sort of…but I made it! 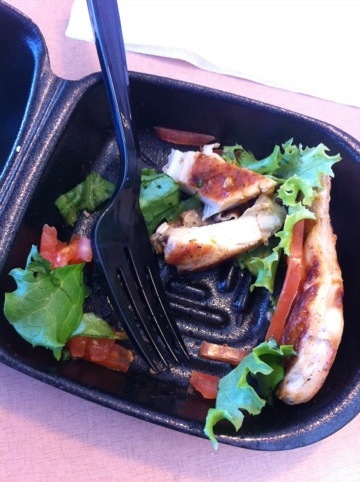 Who doesn’t love the fabulous Chick Fil A chargrilled chicken sandwich sans bread for lunch?? Delicious. Delicious protein. Yeah, I’m quite sure you don’t have two sizes to lose!! The redbuds are beautiful. Spring is my favorite time in Oklahoma. Wish I was there!